Some hamster breeds, like golden hamsters, are more prone to fighting than other breeds, like Siberian dwarf hammies, and littermates, or siblings, are more likely to get along well together than hamsters who are introduced to each other as adults. Even then, some fighting can occur if hamsters are stressed, have limited space or vastly different temperaments. Failure to stop fighting hammies can result in injury or even death. The fastest and most efficient way to stop fighting between hamsters is to physically separate them. Use caution when you do this by wearing gloves to ensure you don’t get bitten or scratched. Move one hamster into a separate cage or tank and give the dueling duo a “cooling off” period of at least a day before you reintroduce them again. Sometimes hamsters are territorial, which can lead to fighting. While you have feuding hamsters sequestered, clean the main cage they share and replace bedding. 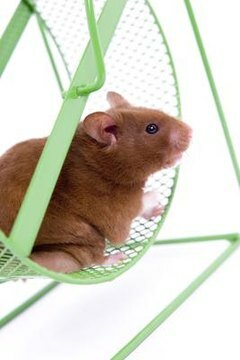 Add new toys, like exercise wheels or tunnels, to give your hamsters something to keep them occupied and expend their energy. Place food in dual locations and add an extra water bottle to reduce the potential of fighting for rations. Sometimes hamsters fight because they’re living in quarters that are too small to accommodate individual space and territory. Consider moving your hammies into a larger cage, one that can be partitioned off into two individual quadrants if they quarrel on a regular basis. Your hamsters will still have companionship without the physical contact. Hamster fighting can become aggressive, especially if one hamster is much more dominant than the other. If fighting is ongoing or one hamster shows sign of injury, seek veterinary attention and permanently physically separate your hammies. Don’t put another new hammie in with a known aggressor. If you continue to house your hamsters in close proximity, opt for plastic or glass cages rather than ones with open bars, as this too can lead to squabbling. Hamsters of the same gender, particularly female littermates, often have the best chances for peaceful cohabitation. Make sure you know the gender of mature hamsters before pairing them off -- consult a vet if you need to. Accidentally housing opposite-gender hamsters together can result in unintentional breeding, even between siblings.